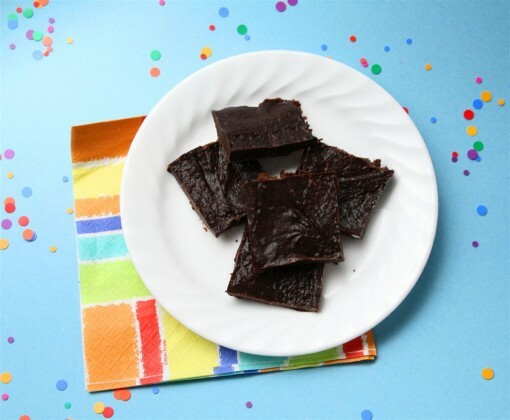 Chocolate Peanut Butter Fudge was posted on March 9th, 2012 and is filed under Dairy Free, Desserts, Gluten Free, Kid Friendly, Recipes, Snacks, Vegan. This entry has 11 comments. You can follow any responses through the RSS 2.0 Comment Feed. Chocolate + peanut butter = perfection. It’s one of the best inventions God ever invented. Every time I see a Reese’s peanut butter cup, I kind of die inside. They are so bad for you. Downright evil…but they taste soooo good.I heard Jillian Michael’s mention that Newman Owns Organics had a “healthier” brand of peanut butter cups. They’re still not exactly a superfood. However, I’m on a mission to find a local place that sells them. I like one piece of this for a dessert. It’s absolutely delicious and it only takes one piece to curb that raging sweet tooth. It’s also got some good fats in there with the coconut oil (check out this post: Why I Love Coconut Oil) and organic peanut butter! Cream the coconut oil and peanut butter with a hand blender. Next, add the rest of the ingredients one by one and cream with the hand blender. Pour into an 8×8-inch pan and freeze for an hour or two. Serve cold. Note: I’m thinking they’d be kind of awesome with some mix ins like grated coconut, cacao nibs, or some raw nuts. 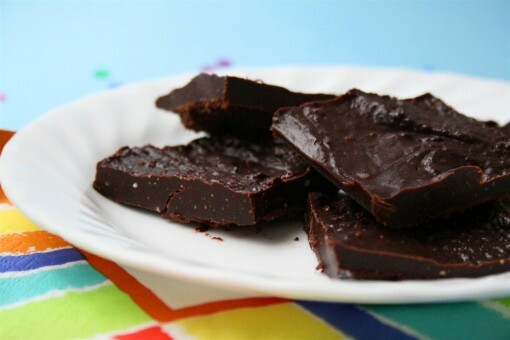 For more fudgey goodness check out my Vegan Superfood Fudge recipe! So maybe you’re wondering how the Birthday Challenge is going? It’s going pretty good. Yesterday did not include a smoothie, this morning I had a big green protein shake. I felt like I had a good amount of protein. Getting up earlier? Check. Did I get a workout before studying? Nope. As you’ll read below, I hurt myself playing volleyball, so I need to take it easy so I can perform well for the next games(s). I’m stretching and trying to get walks in. The day before yesterday I did about 6 hours of volleyball and pulled some muscles…so for the next two days after that I’ve been keeping exercise pretty light in hopes that my muscles heal before tomorrow. Tomorrow is a volleyball tournament we’ve been working up to for weeks. Once the whole thing is done and I’m utterly exhausted from a day of that…I rush off to the city with my family to run a “Moonlight Race”. Half of my family are doing the 6k while two of my brothers and I are running the 10k. The scary part: I haven’t run since last year. Not once. I fully meant to train for the race and maybe even get a new PB. But nope, I totally forgot about the race. I’ve been working out a ton and playing lots of volleyball, but I’ve been focusing on strength and circuit training, not necessarily cardio. I like running, but not in the winter (unless on the treadmill and our treadmill is on the fritz right now). So yah. If I don’t do another post after this, you’ll know that I’m lying in a crumpled heap somewhere… unconscious. I’m so all or nothing. Eat a piece of fudge for me. Have you ever run a race you haven’t trained for? If so, what happened? That looks like a tasty treat! Have to bookmark to try. Good luck for your race, you’ll be fine since you’ve been doing some exercise. I enjoy running too, I’ve done a 7k race when I only did a small amount of training, I think the vibe and energy of the day helps get you through. I pushed myself and my time wasn’t the best, but it was way better than I thought. Good luck! This definitely inspired me to grab some coconut oil at the grocery store this weekend! I haven’t had fudge in years – but PB and chocolate is one of my all-time favorite combos and all of the sudden it sounds so good! Newmans does make okay ones but I like justins version more than reeses! Justin also has a new bar that tastes JUST like a snickers but better! I hbe a wicked sweet tooth so organic “healthier” is nice sometimes! But above all else I only live once so I will not deprive myself! Love your blog and this post! I agree pb & choc is the best!! I’d be curious about those pb cups Jill mentioned too!! You gotta be able to trust her! lol. I just bought some coconut oil for the first time and have had no idea what to make with it…. now I know! :) Good luck on the run, I’m sure you’ll do great! I am all over that recipe! I cave this time of year for the chocolate pb eggs. They are evil. I am an all or nothing person too. I ran a 5k a few years ago that I didn’t train for. I walked most of it. After that I did couch to 5k and ran my first official 5k. The grocery store near me actually sells those PB cups, but I think your recipe is better. Yum! Give your body the rest it needs before that big race and those volleyball games. Good luck in the 6K.